IBM’s continued business pivot will increasingly drive this mature company’s financial performance in the years to come. Though describing it as a "growth company" would strain credulity, International Business Machines (NYSE:IBM) expects to return to growth in 2017, possibly putting an end to one of the more embarrassing chapters in its vaunted corporate history. In fact, IBM shares remain down significantly over the past half decade, and have lagged the broad market by roughly 90 percentage points over this period. This might not make IBM seem like an appealing stock to own. 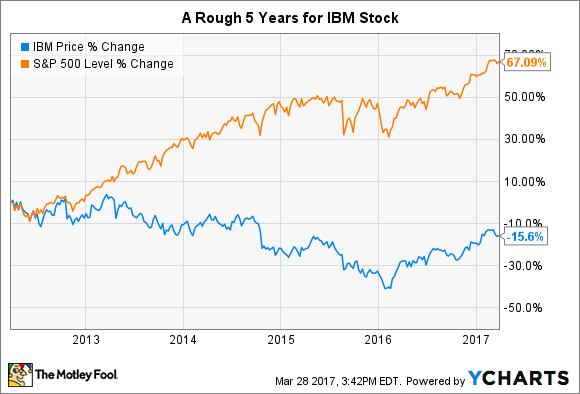 However, considering its below-average valuation and its above-average dividend, there's an increasingly legitimate case to be made that IBM is one of the more appealing value investments on the market today. Shots of green finally started to show through in IBM's most recent earnings release, but investors had to squint to see them, as its results largely showed more of the same. At the surface level, IBM saw its revenues decline for a 19th consecutive quarter, albeit falling by a mere 1% compared to the year prior. However, the company's fourth-quarter profits managed to rise just 1%, which came in well ahead of analysts' consensus estimates. Its full-year 2016 GAAP net income still managed to decline 10%, though. In terms of the encouraging signs, IBM guided for its non-GAAP earnings per share (EPS) to actually return to growth for the full-year 2017. Equally encouraging, sales from IBM's so-called "strategic imperatives" -- which consist of cloud computing, big data, artificial intelligence (AI), and security software -- accounted for 41% of Big Blue's total revenues for the entire year. Strategic-imperatives sales rose 13% year over year, with major subsections, like cloud computing, growing an impressive 35%. IBM is by no means firing on all cylinders, but it's certainly the best performance the company has produced in recent memory. Time to buy Big Blue? IBM is a mature company, and growth from its strategic imperatives will by no means transform it into a growth stock overnight -- or at all. However, that isn't to say IBM doesn't offer an attractive mix of value and income that can be highly lucrative for conservative investors who still want some exposure to tech stocks today. The average analyst sees IBM's EPS nudging barely higher this year. However, analysts then expect IBM's EPS to accelerate to grow at an average annual rate of 2.5% annually for the next five years. Of course, this isn't significant growth, but it's a far cry better than the long-standing declines that have plagued the company over the past half decade. Should this come to pass, investors could also enjoy some moderate multiple expansion, as IBM currently trades at just 12 times its forward earnings. IBM's knack for maximizing shareholder returns shouldn't be overlooked here, either. In addition to the company's current 3.2% dividend yield -- which is far higher than the S&P 500's 1.9% cash payout -- IBM has been arguably one of the most active and adept practitioners of the stock buyback since the year 2000: The tech giant has spent some $108 billion buying back its own shares since the turn of the millennium. In fact, there's a case to be made that former CEO Sam Palmisano masked some of the underlying growth issues facing IBM by continually growing EPS late in his tenure almost exclusively via share repurchases. With IBM shares still cheap, though, and the market still seeming unimpressed or skeptical about the company's future prospects, current CEO Ginni Rommetty could add meaningful long-term value in a tax-efficient manner by repurchasing IBM stock on the cheap. Shareholder Warren Buffett would certainly love this tactic. At the end of the day, it might be more accurate to say that the worst appears to be behind IBM, rather than that the best is yet to come for the century-old tech stalwart. However, the company continues to make progress in its multi-year turnaround. Between this and its bottom-barrel valuation, IBM still makes for an interesting contrarian investment today.